Chrichton's World: Review The Debt Collector (2018): A good Scott Adkins film! 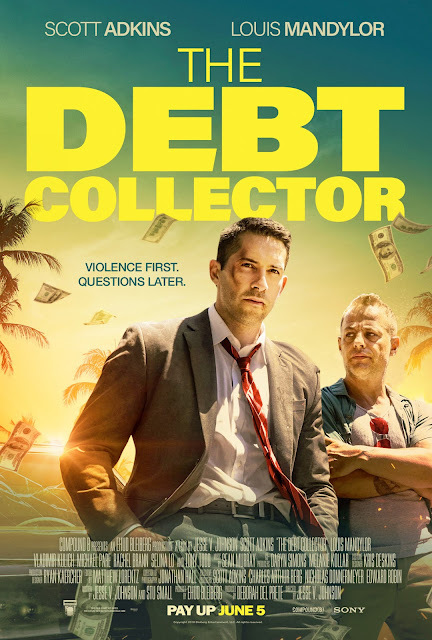 Review The Debt Collector (2018): A good Scott Adkins film! To be honest I wasn't expecting much but I was pleasantly surprised to find out that it delivers on all the action goodness you want from a Scott Adkins film but also that it has an entertaining story to tell. Actually this does seem more to be about the characters than the action. At the core are the dynamics between Scott Adkins and Louis Mandylor. Scott as the rookie debt collector who is very green when it comes to being evil and shady. Then you have veteran Mandylor who already has given up on doing the right thing and just lives from day to day. Adkins has a lot of trouble adjusting to this kind of work but manages to adapt eventually. And I think Mandylor has a lot to do with that. He was charming and had very good chemistry with Adkins. I think Adkins understood that he needed to respond to him instead of playing the lead. And that was very entertaining to watch. The other characters were adequate as well. Although Tony Todd seemed like he was sleepwalking. It wasn't bad by any means. Still he couldn't be bothered to make the character he was playing more interesting. I hardly recognized Michael Paré but his minimal effort seemed to be very effective. Such a contrast. Go figure! The tone of this film is pretty light and comedic for the most part. Then towards the end things get a little more serious and dark. The shift in tone was to be expected since you were forewarned or foretold that it was going to happen. Logically speaking it felt slightly forced. I don't know. This could be that curse a lot of current films are suffering from. Like there is a law that they need to be dark en relentless. I myself was hoping for more optimism and positivity or a much better climax. Then again it's not a film to give you food for thought so this could be me nitpicking a little too much. Action wise it's more the brutal kind where again Adkins shows how skilled he is. Louis Mandylor doesn't fight often but he does make it look like he can box which makes sense since he started out his career as a boxer. He is also an avid fan and practitioner of Muay Thai Kickboxing. The fights certainly are exciting and cathartic. Overall The Debt Collector is a far better film than you would expect. Certainly worth a watch and definitely better than Adkins' Accident Man.